Today for lunch I stopped by the Tim Hortons on Bank Street at Heron Road (1611 Bank Street, Ottawa). I entered and almost stumbled over the front counter all of three steps in. Not sure who built designed this Tim Hortons interior layout, but there is virtually zero space for customer queing forcing people to stand in the doorway if the there are more than two customers waiting to be served. Add in a smaller customer seating area compared to a conventional Tim Hortons restaurant things seem to get worse. This location is almost like the Tim Hortons Head Office merely pointed at a map and said "let's stick one here", then shoehorned a store into a too small existing plaza. I strategically waited at the front as two Tim Hortons employees were flabergasted on how to put together an order of 50 Tim Bits for the customer ahead of me. They started with two boxes and the first one, who took the order at the cash, was explaining that with two boxes there should be 25 Tim Bits a piece. Next, a manager came up and said use the box for fifty Tim Bits and to use that. The 2nd employee was dumbfounded, he'd just finished computing how twenty five Timbits in two boxes equals fifty. Eventually after the second employee was told to count fifty Tim Bits into a box of fifty, computed that and then, somehow, was able to also remember to come with manager to do another task after counting the fifty Tim Bits, I was able to order with the first employee. The first employee took my money, made change and asked me to step to my left to wait at the pickup counter for my coffee and wait for the sandwich and Kettle Chips. The visit get even better as two minutes elapsed and I was told by the lady making the sandwiches that they were out of White Sandwich bun, would I like Whole Wheat? Really? Dare I ask for a refund of my purchase and walk across the street to the Tim Hortons in the Esso Gas Station and then walk back in hopes of getting a seat? I digressed knowing that would be at least 45 minutes which would include the time for the employees to figure out how to even process a refund. As well, it's 11 O'Clock in the morning? How in the heck is a Tim Hortons location out of white buns before Friday lunchtime even truly gets going? "Sure that'll do" was my reply to the offer of Whole Wheat Bun. Three minutes later I had the sandwich and Kettle Chips with me and was ready to go. I found a semi dirty table and sat down. I carefully straightened the table and pair of chairs. Then I strategically wiped the sesame seeds off the table. I quickly surveyed the other tables to find them also in need of at least a quick wipe. The Chicken Salad sandwich was o.k., but obviously would have been better to my tastes if served on a white bun as requested. 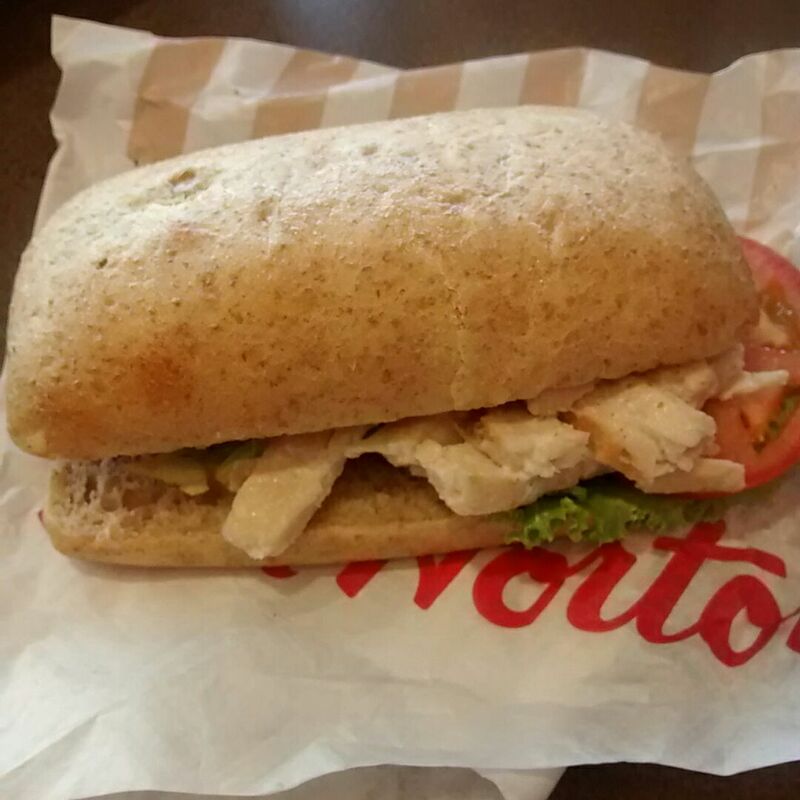 Otherwise, the sandwich was decent with average toppings of tomato lettuce along with chicken salad mix. The Kettle Chips at Tim Hortons are usually kept warm slightly. 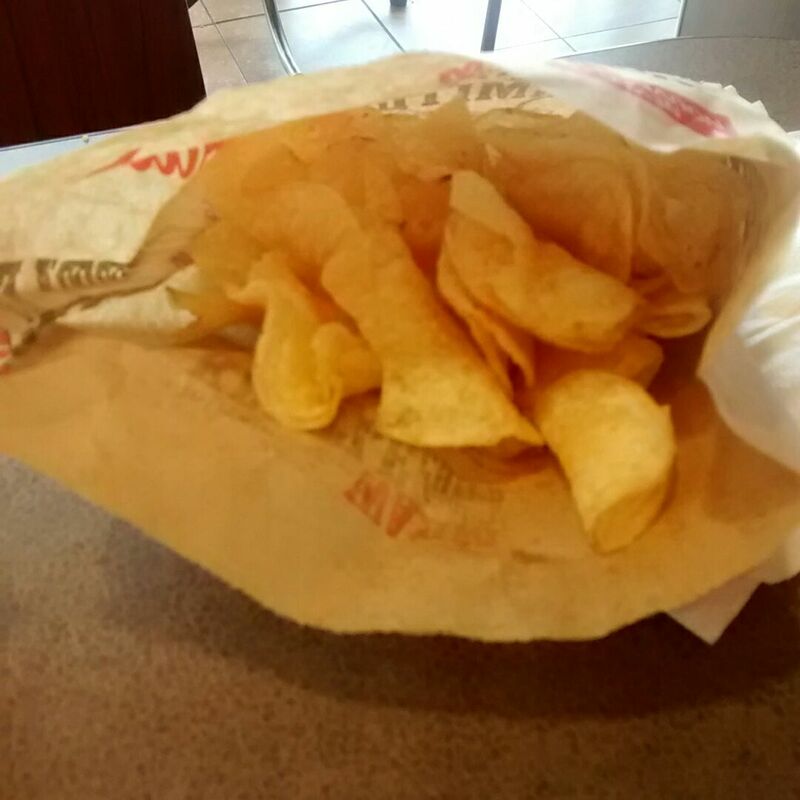 Not so at this Tim Hortons location as the sandwich bar preparer dished them out of a white bag with a ripped hole in it into the standard paper bag the Kettle Chips are served in. Presumably the Kettle Chips are shipped via the Tim Hortons freight system in these white bags and are supposed to be transferred into the standard warming trays in the Tim Hortons franchise locations before being dished out to customers. It seems the last step was missing. 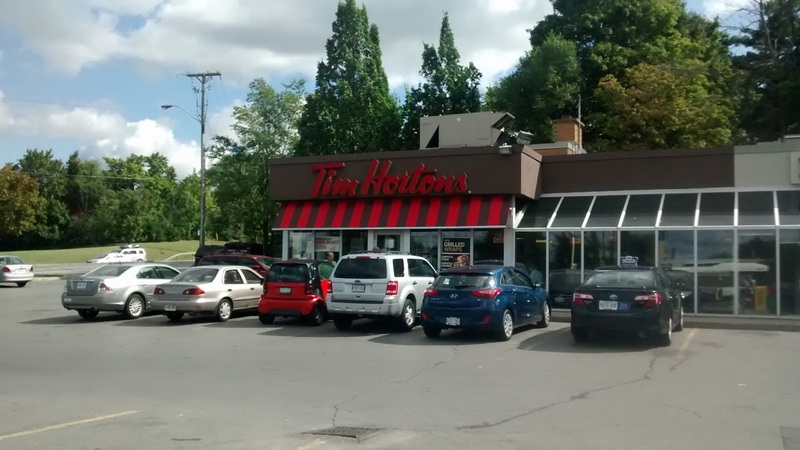 Overall, combined with dirty tables, askew chairs, missing food items and being behind on food preparation, this Tim Hortons location is need of corporate office attention and training. Sure the food was average for Tim Hortons, but the lack of following straight corporate procedures to ensure on hand quantities are sufficient and food preparation procedures are followed is concerning. I wouldn't bank on this location for a standard Tim Hortons meal.